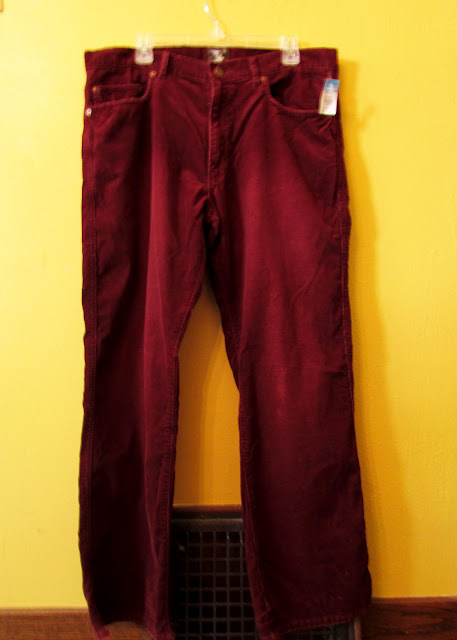 Tangible Artiste: A Project A Week: Bell Bottoms or skinnys? A Project A Week: Bell Bottoms or skinnys? I am all for the color trend going on in pants right now, It's so much fun especially when it comes to the fall colors. I picked these babies up at the Goodwill for $6 and they are my first item from Hollister. I do wonder what the guy was thinking when he bought these, maybe he didn't realize what color they were until after he got into the sunlight or maybe they were a gift from a well meaning stylish girl friend who's feelings he wanted to spare so they ended up in the donate bag. What ever the story, they are mine now! Now the hard decision should I make skinny or bell bottoms out of them? What do you think? What would you wear more? Skinny seems to be the way to go these days...with boot season and all. But I don't know what's up and coming! I would do skinny only because it's more in. Plus, those look like corduroy and that fabric has a habit of making funny noises when rubbing together which I feel like you may end up experiencing more with bell bottoms. Although, I am not sure if the styles are changing because skinny jeans have been in for quite a while. Either way, the color is great and I'm sure they will look spectacular!